Not long ago I thought about writing an op-ed piece for the local newspaper entitled “Gas Doesn’t Cost Enough Yet,” but then it occurred to me that the time-honored practice of caning journalists might not be completely dead. Though I chickened out on the article, I still hold to the idea. As I write, a barrel of oil is going for close to $100 again, only to have Hurricane Ike show how volatile the pricing and distribution system really is. There seems little doubt that the world’s energy paradigm has changed forever. With Asian economies competing for fossil fuels, adding to a growth in demand that already outpaces discoveries of supplies, any price decrease seems sure to be temporary. The era of prosperity fed by artificially cheap oil is over and, despite the hardships its end is causing, I can’t say that I’m completely sorry. Car dealers are practically paying people to take “full-size” pickup trucks and SUVs off their lots, and factories that build the monsters are closing. Good. Businesses are scheduling more teleconferences instead of flying people to meetings. Good. More commuters are considering mass transit, and bicycle and motor-scooter use is up. Good. More people are moving to revitalized downtowns, where they can walk to stores and entertainment venues. Good. And—though I have no quantifiable evidence to back this up—I imagine that more birders are hesitating before driving for hours or hopping on a jet to look for a vagrant just to add another checkmark to a state or national list, to which I say: very good. Before I get all sanctimonious here, let me offer a list of mea culpas. I recently returned from a vacation to the Colorado Rockies during which I spent $437.90 on gas. I watched McCown’s Longspurs parachuting in song flight over the plains, Mountain Bluebirds hovering over foothill meadows, and American Dippers dipping in rocky creeks, all the while spewing hydrocarbons and supporting corrupt governments from Saudi Arabia to Nigeria. For 20-plus years I’ve flown to places around the globe to see birds, simply for my own pleasure. And I’ve chased vagrant birds, too, canceling Saturday plans to drive 50 or 250 miles to search for some rarity spotted at a reservoir, feed lot, or garbage dump. My carbon footprint, like that of many First Worlders, has been and still is (optional insertion here of word “obscenely”) large. But enlightenment and atonement are cornerstones of religion, right? If it were ever too late to change, there’d be cobwebs growing in a lot of confessional booths. And the catalyst for change doesn’t have to be a ray of light from above; it can just as well be four-dollar-a-gallon gas. A couple of situations, one new and one old, in my home state of Arkansas come to mind in connection with this. The first involves tallgrass prairie in the northwestern part of the state, which once covered thousands of acres but is now reduced to a few isolated patches. Most of what remains has been protected, thanks in part to local birders who regularly visit prairie sites. They documented species such as Short-eared Owl, Willow Flycatcher, Bell’s Vireo, Sedge Wren, Grasshopper and Le Conte’s sparrows, Painted Bunting, and Dickcissel, as well as non-bird critters such as ornate box turtle and prairie mole cricket, all the while building the case for public ownership. Another parcel of prairie was acquired recently by the state after just such efforts. By contrast, I remember one January when a Fork-tailed Flycatcher appeared in central Arkansas, attracting a mini-convention of birders the next morning (I was in attendance) hoping to see this stray from the tropics. Lots of $1.19 gasoline got burned that day, nearly everybody saw the bird—and it meant nothing, except that everybody’s state and United States lists (and many world lists) advanced a notch. It wasn’t a precursor to range expansion, it wasn’t an endangered species, it wasn’t part of a significant migration trend. It was just a mentally or physiologically defective individual that flew a long way in the wrong direction. When a severe cold front passed through a couple of days later, it no doubt met its Darwinian fate and became, as somebody said, “possum food.” There have been others, too, that attracted birders (again, including me) from far and wide: Green Violet-ear, Couch’s Kingbird, Sage Thrasher, and Lesser Goldfinch, just for starters. Southwestern Arkansas is slowly being invaded by “Texas” birds whose ranges are advancing north. Black-bellied and Fulvous whistling-ducks, Neotropic Cormorant, White-tailed Kite, Inca Dove, and Cave Swallow occur with more or less frequency, and Least Grebe and Crested Caracara are on the way. Is the reason climate change, habitat change, or some combination of those and other factors? Whatever the cause, we know it’s happening because local birders conscientiously patrol their (figurative) backyards, attentive to maps and the calendar, as well as to what’s flying and singing around them. So what’s more important: spending six hours of a nice day in a car so you can pull up in somebody’s driveway, spot a Calliope Hummingbird at a feeder, and add a dot next to a name on your birding software, or learning the birds in your own area, noting their migration dates and population trends, and documenting habitat changes—especially if you share your information on the Cornell Lab of Ornithology’s eBird program? If gas prices discourage the former and encourage the latter, even a little, then OPEC (or the villain of your choice) has done the natural world a small favor. 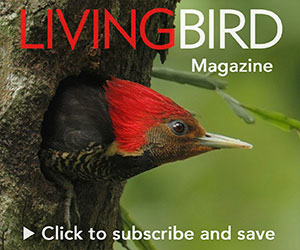 We all remember stories of intensely competitive people who heard about a Blue Mockingbird in Arizona or a Collared Forest-Falcon in Texas and quite literally drove to the airport, booked a flight and a rental car, and set off—their primary goal being to maintain their places in the rankings of America’s top birders (read: listers). This kind of travel, I think, is broadening only to the ego. Several thoughtful observers have recently predicted that air travel will soon be restricted to the wealthy and to government officials—we’ll see the “de-democratization of air travel” in the words of one self-proclaimed Cassandra. The traditional airline financial model, they say, is unavoidably doomed in an era of expensive fuel. Despite the large carbon debt incurred by jets, I’ll be sorry if this comes to pass. I’d hate to think I’ll never again hear the wonderfully bewildering sounds of a forest in the Neotropics, or order a plato Ibërico of serrano ham and cheese at a sidewalk café in Spain. Never mind the trogons and bustards: I know that travel has made me a more well-informed (and better) person—if only because I now understand that, almost without exception, every American is quite literally rich in the context of our planet. And I’ve seen demonstrated, time after time, the Pollyanna-ish idea that there are good people in every town and every city in every country. This seems worthwhile. The best we can hope for, maybe, is some kind of middle ground—a world in which travel is more expensive but still feasible for us plebes, with planning and some sacrifice. No more spur-of-the-moment weekends in the Rio Grande Valley, no more long drives to add Yellow-billed Loon to a year list, but the occasional opportunity to step out of an airport somewhere and smell night air fecund with unknown flowers and fruit. And if not? There’s the cold comfort of knowing we have only ourselves to blame. Five-dollar-a-gallon gas? Europe had that long ago, and most people there drive small cars that get good mileage. There’s no reason why every private vehicle in the United States shouldn’t get 30 miles per gallon, except that for 30 years the evil triumvirate of oil companies, auto manufacturers, and their friends in Congress have blocked efforts to raise corporate average fuel economy standards. And all the while, average vehicle horsepower in the United States rose from 102 in 1981 to around 210 today. For what? When I mentioned this column’s topic to one friend he wrote, “Despite the fact that I agree with you, I hope you won’t come down too hard on the chasers. They inspire and energize the rest of us and put some shine on our local interests—which of course isn’t their point, exactly, but it is an unintended consequence.” This man takes an admirably clear-headed view of environmental issues and, equally admirably, he can be counted on to point out that few circumstances can be simplified to black and white. Not coincidentally, he has worked with great success on land-use and wildlife conservation matters. I see what he means, but I think chasers inspire other chasers. “Oh my god, there’s a Sharp-tailed Sandpiper at Mallard Lake. If I don’t get over there, everybody’ll see it but me.” I know the feeling, just as I know the feeling of some other urges that I’ve now decided aren’t good for me. In the future, I hope to learn to enjoy even more the birds, butterflies, dragonflies, snakes, lizards, and flora in the natural areas near where I live, and to work to protect them and add to their number. If this comes off as preachy, then so be it. Preachiness is better than the anger that threatens to take over right now, anger that’s mostly directed at the fools who, through ignorance or avarice, refuse to admit that conservation is 10 times easier and 10 times more effective than desperate attempts to squeeze the last few drops of oil from the Earth—the “drill here, drill now” morons who can’t see beyond the numbers on a gas pump. Very well then, that brings me back to my original point. As long as I see so many people using fossil fuels simply for recreation—blatting motorcyclists riding around aimlessly on weekends, buzzing jet skiers on lakes, roaring ATVers tearing up national forests, and birders driving 500 miles just to put a checkmark on a list—then gas doesn’t cost enough yet.